Cookies are integral to celebrations, especially holiday celebrations. Before holiday baking season comes along, you need to add a copy of Cookie Love by Mindy Segal to your “keeper” cookbook collection. “Everybody has a cookie memory, whether it comes from Grandma, Nabisco, the neighbor down the street or your grade-school bake sale. My goal then and now has been to take the ordinary cookie memory and make it extraordinary.” —Chef Mindy Segal, with Kate Leahy, Cookie Love: More Than 60 Recipes and Techniques for Turning the Ordinary into the Extraordinary with Photography by Dan Goldberg. Shelve the cupcake tin and dust off your cookie sheets. For too long, bakers and dessert eaters have held up the cupcake, the tart, the cheesecake as confectionery miracle while cookies have been overlooked and neglected, bouncing around lunchboxes and lingering in office break rooms. 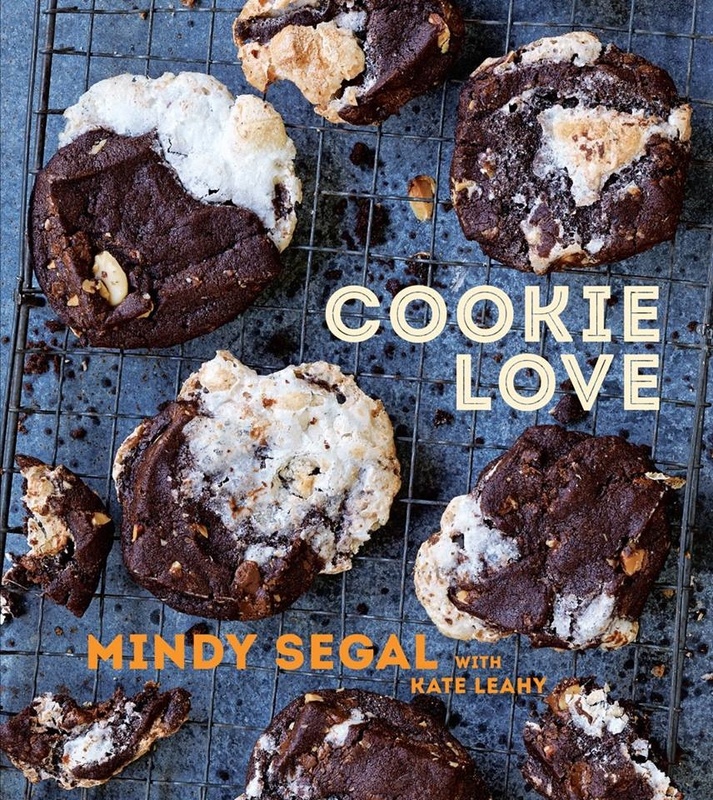 Chef Mindy Segal, owner of Hot Chocolate Restaurant and Dessert Bar in Chicago, reminds us how much there is to love about the cookie in her newly released book Cookie Love. (Ten Speed Press | Apr 07, 2015 | 296 Pages | 8 x 9 | ISBN 9781607746812.) (affiliate link. if you click through and make a purchase, I’ll receive a small commission to support this site. see disclosure. Segal is so passionate about cookies that she has vowed to always offer a cookie plate on her dessert menu. The chef’s own cookie love started in childhood, much of which was spent in the kitchen–a side effect of always being grounded. She said she fell into baking because she needed a creative outlet. Segal’s parents gave her a Kitchen-Aid mixer for Hannukah when she was 13. So, with Cookie Love you get a cookbook borne by a woman passionate about cookies from childhood, who has honed her skills and techniques with batch after batch after batch of cookies. Segal sharpened her skills in culinary school and then working in the kitchens for Chicago’s top chefs. Caution: you’re going to have a dilemma when you pickup this book. You’re going to want to fly into your kitchen and start baking but you’ll also want to keep reading Cookie Love. And, you won’t know which cookie to bake first. I myself am torn. I’m tempted by the Black Sabbath, an Oreo-style sandwich cookie held together with peppermint frosting finished with melted chocolate and a peppermint brittle. But, there are is also a recipe for heart-shaped, violet-hued Violet Hearts, which are unlike any cookie I’ve ever seen. They look like they should be part of the packaging on a fancy perfume. The cover beauty, Jill’s Spiced Double Chocolate Cookies, with two variations, teases me too. One variation calls for a swirl of caramelized white chocolate. The second combination is of the rocky road variety with milk chocolate hazelnut bars, smoked almonds and sliced marshmallows. But, the Toasted Coconut Spritz appeal to me because I already have the ingredients in my cupboard. But then there are Chocolate Pretzel Shortbread cookies with Milk Chocolate Caramel and…well you get the idea. Being of Eastern European descent, Segal has a chapter devoted just to rugelach and kolachkes, all which start with a classic cream cheese dough. Cookie Love is user-friendly. You’ll feel like you’re sitting down with Segal and Leahy over a cup of coffee. There’s humor and plenty of stories about Segal and her life and her experiences as a chef working under the likes of Charlie Trotter, to name just one. The cookbook is well-organized with each chapter devoted to a specific form of cookie: drop, shortbread, sandwich, egg white, spritz and thumbprints, twice-baked, rugelach and kolachkes and bars. Be aware that several recipes contain multiple steps, which may need to be done over a couple days. Segal said she didn’t follow recipes when she was growing up (she was dyslexic) would look at a recipe’s list of ingredients and get busy. She encourages readers to experiment and tweak her recipes to suit their tastes. Yet, recipes are explained in the book step by step. Beyond the recipes, Cookie Love contains lots of information, including a Basics chapter, which includes recipes for marshmallows, toffee, jimmies, jam and preserves, hot fudge sauce and caramel sauce among others. There are chapters at the back of the book devoted to: My Cookie Pantry, Tips of the Trade, Tools of the Trade, and Sources. What I especially liked about this book is Segal’s understanding that not all bakers have scales in their kitchens. So she explains how to accurately measure flour and sugars using a dip and sweep method. I swoon whenever I see someone arrive at an event with a tray of cookies in hand? Do you? Are you passionate about baking and eating cookies? Do you believe there should be a dozen or 101 homemade cookies in every cookie jar? Then Cookie Love is for you. Your turn, what’s your favorite cookie? Have you been to Segal’s restaurant? Tell me in the comments. I think you already know my new favorite cookie: Espresso Chocolate Shortbread.